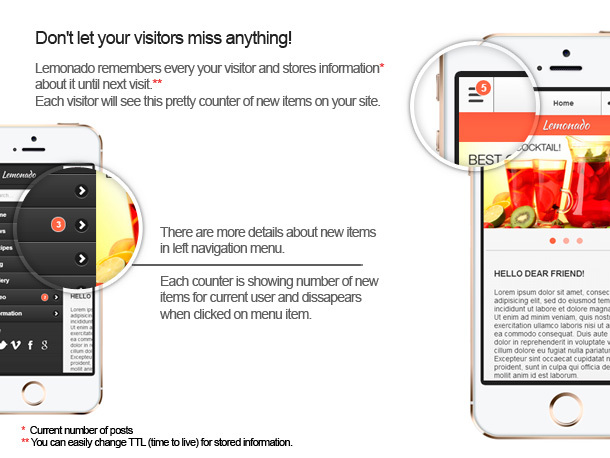 Lemonado - Multi-purpose HTML5 & CSS3 Mobile Web Application! This document covers the installation and use both of the HTML and PHP versions of this application and reveals answers to common problems and issues - I encourage you to read this document thoroughly if you are experiencing any difficulties. When your users load a page, retina.js checks each image on the page to see if there is a high-resolution version of that image on your server. If a high-resolution variant exists, the script will swap in that image in-place. The script assumes you use Apple's prescribed high-resolution modifier (@2x) to denote high-resolution image variants on your server. For Retina support it's recommended to use a double-sized image (with @2x at the end of file name) in the same folder with the normal size image. Put both images (normal and 2x) in the same folder. Firstly, unzip the downloaded file to a directory on your computer. It contains a folder named lemonado. You will find the HTML and PHP folders inside it. Choose the version you want to install (PHP or HTML) and upload the folder contents via ftp to any directory on your server. Lemonado supports installation in root folder, into any sub-directory on your server or in sub-domain. Once you uploaded all files to your server, you need to activate Apache's custom error pages handler and deny access to the settings.xml and config.php file. This is an optional step, but it's highly recommended. Info. For Apache Web Server. The files contain paths to the custom error pages such as 404.php. Note: This way you can define additional pages for any server errors. For example, you can create a new 401.php (401.html) file and define it in the .htaccess (web.config) file. You can find the full list of of HTTP status codes here. This file will block access to your settings.xml from world. Important! It's strongly recommended to remove read permissions (x00 value) from the lib/settings.xml and config.php files to prevent them from reading/stealing. Info. For PHP version only. config.php file. This is a main file. It defines the absolute and relative paths to the files and reads the settings.xml file with settings. 4xx.php or 5xx.php files. These files are templates for web server's errors. index.php. This is a Home Page of your web application. /assets folder. This folder contents styles, images and scripts. /lib/settings.xml file. This file contains all settings for your application. /templates folder. This folder contains the header, footer and panels templates for all pages. /web.config file. This file contains the Microsoft IIS error pages handler code. /.htaccess file. This file contains the Apache Web Server error pages handler code. Info. For HTML version only. 4xx.html or 5xx.html files. These files are templates for web server's errors. index.html. This is a Home Page of your web application. Lemonado is based on the newest jQuery Mobile 1.4.x framework and absolutely compatible with it. This means that you are able to use any jQuery Mobile's Widgets on any page from this widget reference page. Please read this reference accurately before edit any page. Jquery Mobile and Lemonado provide wide range of widgets on any taste, from pretty pop-ups to nice dialogs, from custom form inputs to beautiful list styles. All widgets are flexible and has many settings. Admin page is available on www.youraddress.com/login. 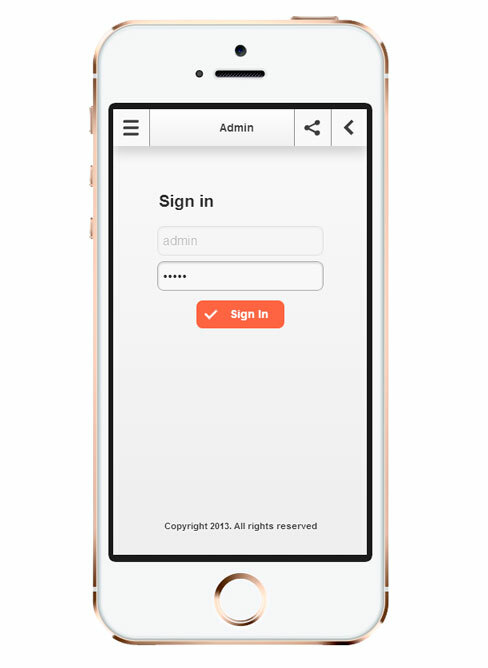 Go to the admin page and enter the password. Default password is set to admin. You can change your password at any time. Define your site color, Disqus shortname (see Comments tab), your email, address, etc. to make your site ready. Note: Password is stored in XML file in encrypted mode. For safety purposes once encrypted it can't be decrypted. If you lost your password the only way to reset it is edit XML file. Open the settings.xml file in your favorite editor. You can find it in the /lib folder. To set up new page you need to create new template file or edit existing template file. There is a default.php/default.html file you can use as the reference for new pages. There are more than 20 page templates included already. For example to edit Home Page you just need to edit the index.php/index.html file. Slider can be inserted into any page, not only home page. You need to add the owl-carousel class to a div and append img tags to a divs with item class. That all. Note: Do not include more than one slider per page. It may cause page errors or make slider do not workable. Advertisement can be inserted into any page, unlimited times. See the information.php for the reference. For more information how to use Google Static Maps visit Static Maps API V2 Developer Guide. Lemonado uses Disqus comments system. It's a 3rd-party comments system. Before you can use and moderate comments on pages, you must sign up on Disqus. The easiest way to set your site shortname is to do it via admin settings panel (see Setting up pages tab). You will find the "Disqus Shortname" field there. Note: Do not include more than one comments section per page. It may cause page errors or make comments do not workable. Every time you are adding new post, article, news etc. you can inform your guests about it. When a user visited the site for the first time, the information about current number of articles is stored in his browser. This information is unique per user. User will not see any counters until you add a new article. Storage time-to-live is limited and expires after 10 days. You can change TTL in settings panel or edit assets/js/custom.js file manually. You can change TTL editing assets/js/custom.js file manually. Note: Counters are available for top-level menus only. Adding counter to a sub-menu may cause errors. Open the templates/panel-left.php file in your favorite editor. Change the data-count value to a value that represents the current number of items on page you are tracking. Do it every time you are adding new items on the page. Do you have a WordPress-based site/blog? Lemonado can be connected to any WordPress installation! Put your copy of the Lemonado on any folder on a server where your WordPress is installed, define path to the wp-load.php file and...done! For the reference see the wp-posts.php file. In this file you will see how I defined path to my own WordPress blog. Please use an absolute path the wp-load.php. You can view your current absolute path to the Lemonado folder on the Wordpress page. Now you can use the whole power of your Wordpress blog! You can run fully-functional WordPress' Loop, change posts structure/layout and much more. The standard loop example you can see in the wp-posts.php file, but you can change a WordPress' query to output custom category, posts, taxonomy, et cetera! For the manual/examples see The Loop and WP_Query documentation. Please note it may require some programming skills. Please ask help from any person familiar with WordPress or PHP programming or drop me a line if you are not sure. Lemonado has the optional panel with settings stored in XML file. If you want resell the web application or just make it more comfortable you are able to add new options easily. Open the lib/settings.xml file in your favorite editor. Add unique ID, choose type of option from the list below, add the title and description. Value field is used for the first initial (default) value. Leave blank if you are not sure. Note: Some options like select, switch, radio, checkbox and range are require additional nodes. You must define them. Look the settings.xml for the reference. This code will group all fields between the nodes into the collapsible field with "General Settings" title. ...and you will see #000000 on the page. As you can see we used the heading_color ID value from the XML as PHP variable. For more examples and reference see the settings-output.php file. ⌛ 'Add to Homescreen' pop up window finally adds Mobile Chrome support and a lots of new features. Works on Androids and iOS. ⌛ Updated the OWL Carousel script to the latest 1.3.3. ⌛ Updated the Retina script to the latest 1.3.0. ⌛ Fixed the 'Gallery' and 'Video' pages in the HTML edition. + All the PNG images were compressed via SuperPNG script. More than 55% of the files size saved. ∞ Improved page load speed. ⌛ The URL share plug-in tracker from SharedCount.com was updated to their new API. Now the endpoint domain is: free.sharedcount.com with 10,000 quota queries per day. The old api.sharedcount.com is a deprecated endpoint and will be permanently discontinued on January 15, 2015. ⌛ Fixed the WordPress integration 404 error in some cases (Thanks to Martin). + Added WordPress posts pagination and posts per page functionality. ∞ Improved the WordPress integration mechanism. Now it support all features of a wp_query function, etc. + Added swipe events to open panels. Now you can open a panel just swipe right/left. ⌛ Updated the jStorage script to the latest. ∞ Other improves and fixes. ⌛ Fixed Android 4.2.2+ browser issue. Header is stretching 100% of screen height. ⌛ Updated the jQuery Mobile script to the latest 1.4.1. ⌛ Updated the jQuery script to the 1.10.2. ⌛ Updated the share counter script. Added required API key. ⌛ Fixed jQuery Mobile CDN links issue in B-grade browsers. ⌛ Updated the jQuery Mobile script to the latest 1.4.2. 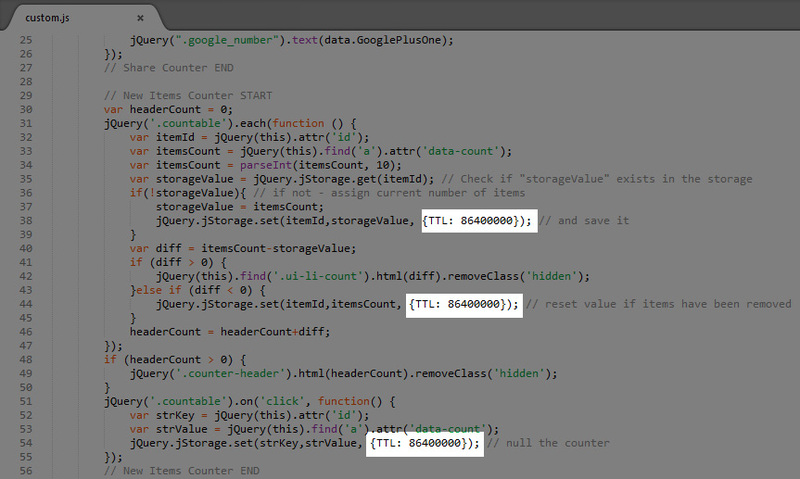 – Removed custom Google Analytics code from the PHP version.